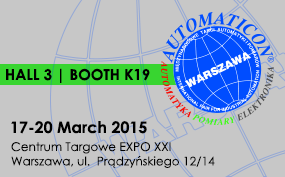 ABI Electronics will be represented at XXI Edition of AUTOMATICON, 17th to 20th March, 2015. It is the most important trade fair for automation, control, measurement and robotics in Poland. The mission of the event is to promote new technology and solutions for industry. Every year we have good occasion to see new products, software, components and measuring devices, as well as the most attractive for many - complete applications. For a chance to discover ABI's products and to discuss your requirements with our local partner Tespol, please visit us at HALL 3, BOOTH K19.